The first event happened on Thursday, which is different from most camps. 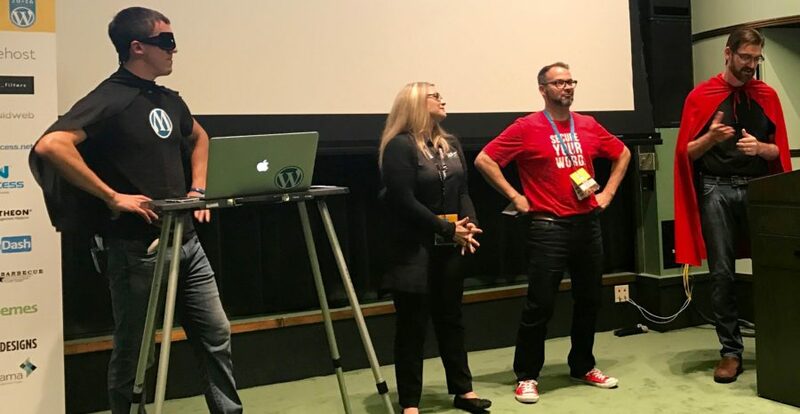 It was specifically created for those who have never attended a WordCamp and was designed as a “meet and greet” so attendees could get to know each other before the main event. There were several hosts and their task was to ensure that everyone interacted with each other, especially people who tend to be more introverted than others. This icebreaker event was sponsored by Web Savvy Marketing and iThemes, and the feedback from participants was very positive. Registration began at 7am and sessions started promptly at 8am, but different from other camps, they only ran until 12:30pm and included several panel discussions. 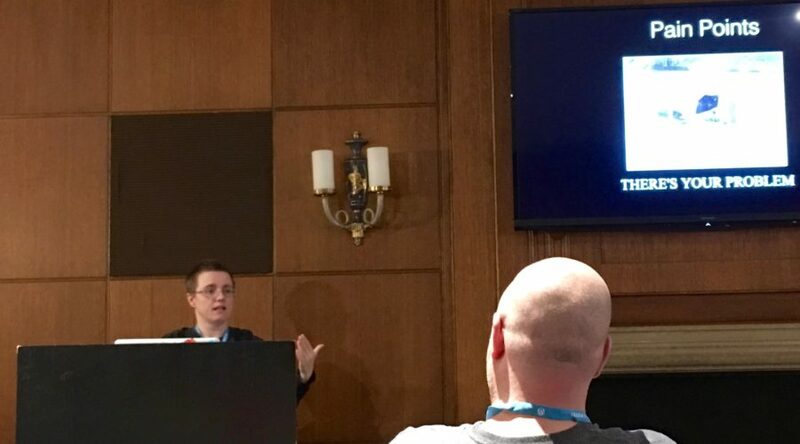 I was honored to be on the “Building Software that Sells and Scales” panel alongside Rebecca Gill, Cory Miller, Chris Christoff, and excellently moderated by Justin Ferriman. After the sessions ended, there were lunch breakout events. People had the choice of attending one of 11 different lunch locations, with each one having a specific topic of discussion and led by one of the organizers or volunteers. I chose to attend the “Selling WordPress Plugins” lunch at the “The Original Cottage Inn,” which was a short walk from the Ann Arbor Union. There were some great discussions over some of the best pizza I’ve had in years. After lunch, we had the choice of participating in one of the several scheduled activities such as kayaking, tennis, a museum tour and a tour of “The Big House” at the University of Michigan stadium. This day started with the keynote speech by Cory Miller, which many people found inspiring. 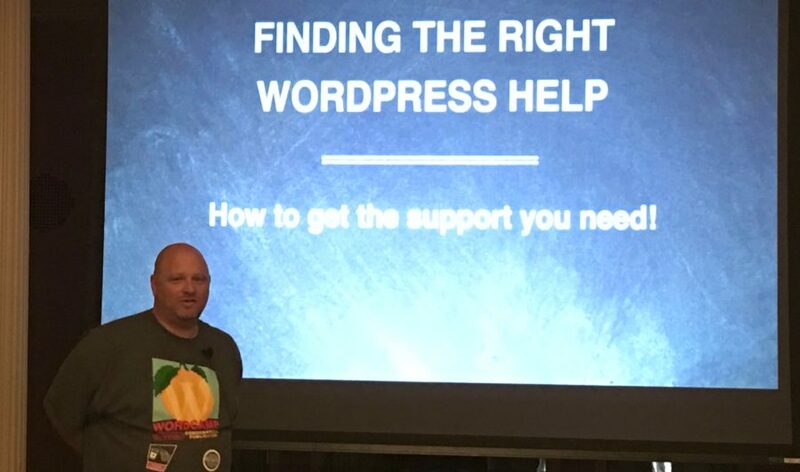 The focus of his talk was on the importance of creating and nurturing personal relationships within the WordPress community. Local Development. What is it? Why do you need it? These are just some of the questions Marc Benzekein answered as he showed the audience how to create a fully functional WordPress environment on their own computers in just a few minutes. He also talked about some of the best practices when incorporating it into your workflow. Rich Robinkoff discussed the confusion experienced by new users of WordPress as it related to WordPress.com vs. self-hosted WordPress installations. He gave actionable advice and resources on where new and seasoned users could find the specific kind of help they needed. Kyle Maurer and Adam Silver continued in their series of “WP Battles” with a fun presentation detailing the ways in which hackers attempt to compromise WordPress-powered websites and the actions users can take to mitigate the chances of becoming a victim of the evil villain, Malwarius. Toward the end of the session, the hero called in his professional security service friends, SiteLock and Sucuri, to protect his sites from the bad guys. Andrea Rennick showed us a day in the life as a support manager for StudioPress. She talked about how to deal with vague support requests without sounding terse and some great tips on streaming your support responses through the use of pre-written snippets while still giving the end user that personal touch. Sidenote: I’ve been friends with Andrea and her husband Ron for many years online and in email conversations, but this was the first time we actually met in person. Another example of the importance of getting out into the community in person. I presented this session and detailed my journey of finding WordPress in 2005 and the various twists and turns I took professionally and personally through the past 11 years. Some emotions snuck up on me unexpectedly when talking about my family and I had to take a short pause to compose myself. That seemed to make a connection with several people and I was pleased to have discussions afterward thanking me for my honesty and transparency. The takeaway was that WordPress was the one constant through my own journey and that others had the same opportunity if they just follow their passion above all else. 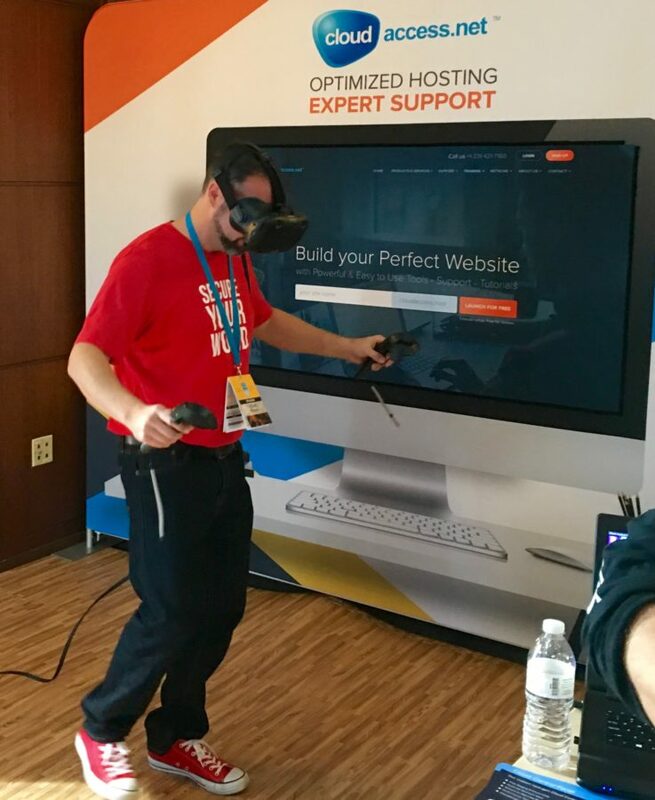 One of the sponsors, CloudAccess, brought a virtual reality setup which I had the opportunity to try out. In the image below, I was standing at the end of a wooden plank on the edge of a 30 story building. It was all too real, especially when they told me to step off and fall to the ground! I feel like I say this a lot, but this was definitely one of my favorite WordCamps this year. The unique schedule, the focus on personal relationships and networking and the sessions were all designed to make every attendee comfortable and ensure they learned a lot about utilizing WordPress to meet their individual and business goals. Congratulations to the entire organizing and volunteer team and also to the sponsors for making this one especially memorable of all the WordCamps I’ve been able to attend.